I got the great opportunity to join KOE’s website and be a part of their forums. It was nice to be accepted into their guild family and get to know a bit more about another one of the guilds in our great community. In the Q&A we get to meet Lawrance, the guild leader of KOE. He takes time to answer my questions and also have a few members offer their quotes about the game and their guild. How long has your guild been together? 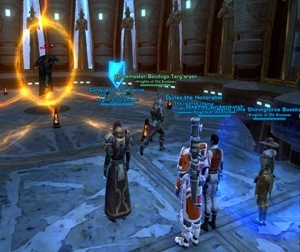 Did you form the guild specifically for SWTOR or does your guild participate in other games? Our guild has been together for over 3+ years now… both in the SWG & SWTOR gaming communities. Some of our members and friends from SWG have joined us in SWTOR. Many other guild members have come from other online MMOs – the majority from WoW. They have added great input to the guild regarding their own online gaming experience. Having been involved in Star Wars MMOs, do you think BioWare has captured that “Star Warsy” feel…Do you feel like you are playing in the Star Wars universe? Overall, I think they are doing a decent job incorporating our characters into the heart of each of the SWTOR storylines as we quest. There has been some very positive feedback from guild members on this PVE component of the game. However, our SWG membership (vs WoW members) are used to being able to interact more with the environment as a sandbox game (craft more items to use, multi-passenger speeders / spaceships, pets we can use for combat / ride as mounts, more buildings / furniture we can sit, player cities we can interact with (we heard something about a guild ship in this game, but not much has been said yet on its release), etc. The game is still being fixed and changes made, do you think BioWare is going in the right direction? What are some ways you think the game could be improved for players in general and also guilds? I personally believe that BioWare has started a nice looking game, but the PVE content delivery and PVP upgrades have been moving too slow for the fanbase. Many players have reached end-game content already. New upgrades / rollout suggestions: PVP inter-server Warzones, improve open-world PVP (Ilum crash issues killed open world PVP that many wanted), PVE content (which is already being addressed, but slow to release), Pet mounts and combat pets (where is HK?). For example, like a Tauntaun mount we could acquire from Hoth. I would also highlight that greater guild controls and a place for us to convene (whether it be a guild ship they have suggested or even player cities) is very important to a player’s social experience. 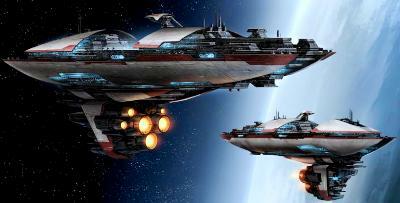 I also believe the SWTOR development team should take a review of the SWG Bounty Hunter tracking system. Many players enjoyed participating in this module and it made Star Wars feel more real to the fan base. Bounty hunters could take out duel contracts on other MMO players or NPCs (i.e. Hutt cartel mission terminals /contracts placed by other players killed in PVP) for rewards. Both hunter and prey might enjoy rewards if either won the fight. As with most guilds, KOE has specific loot for events, operations, flashpoints etc. Can you explain to our readers how the guild decided on these rules and how they work? Does the need for companion gear ever get brought up and how do you all handle that? Our loot rules were listed above in the first reply post. We came to the formation of these loot rules based on my participation (as well as other guild team leaders) with other JC server guilds and listening to raid members. Our leadership felt these rules were the most appropriate to all raiders so they would feel satisfied that the rewards were handled fairly and by the /roll of the game based on three stages: 1.) Need by class, 2.) Greed by companions, 3.) Greed by crew skill or cash. If we are running a complete guild operation raid, then the cash roll will often go to the guild bank. Loot rules are always discussed prior to start of the raid (often in Ventrillo)… especially to non-guild members who may be unfamiliar. Lawrance, your main character is a Jedi Guardian. Do you play as a main tank or do use a different skill spec for this advance class? What do you love about this class and what is one thing you would change? 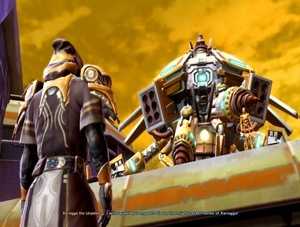 JT, thank you for asking, yes, my main character Lawrance has always been a lead tank in SWG, as well as SWTOR. I enjoy leading / participating in raid groups and playing a group defender in PVP Warzones and open world PVP. I have also enjoyed playing the roles of a combat medic, a bounty hunter, and a creature handler / beast master (we created pets for other players…mounts and combat pets) in SWG. I hope to play those here, as well, one day. In regards to the Jedi Guardian spec, I love the leaping ability and CCs, however I am not too pleased to hear about “nerfing” our damage skills in the future SWTOR release notes. I think this is a mistake. Not all Guardians are just tanks in PVE operations where DPS is not as important as PVP. We need to be able to do adequate damage in PVP to defend nodes / doors / other players. Not just take hits. My two cents, if I could change anything, I would add an additional AOE ability to both faction sides. From researching your guild, Knights of Old Enclave tend to be a part of every aspect in the game. Do you find it hard to have a guild of your size and cater to multiple styles of gameplay? Does the guild have specific leadership to help in these areas? JT, not at all, we love having a very active guild membership and we have many leaders within our guild who help us manage all of the different types of gameplay / activities that you describe. We have guild leaders for PVP, Operations / Raiding, Crafting, Social / World events, Recruitment, Communications, etc. All KOE leaders volunteer, serve, and give dedicated time to eventually be promoted to the rank of Officer / Councilman. “Leadership by many” is what makes our guild strong. Our aim is to build a guild with a large council base that can operate the guild activities when others are on hiatus…and to have active membership for the future. Your guild is also into hosting events. Can you tell us about some of the type events your guild hosts? We have recently run a lot of SWTOR Hard-mode Operations as well as Story-mode Ops for two different raid teams. They have been very successful. Videos of our raids are posted on our website frequently. We are currently seeking new 50+ members to join us on these raid teams and to progress forward with additional teams. Experienced raiders might be asked to lead other raid teams once they are geared and have shown leadership skills / qualities. Also, we are currently forming ranked PVP teams / activities for the future… so 50+ PVP players are also welcome to join us in KOE for these future events. I read on your forums your guild is getting close to the guild cap in the game. Does this mean the guild is not recruiting, or is KOE still looking for new members? If you are taking applications, what is the best way to contact you or other officers about joining the guild? We are still recruiting. Our goal however is to maintain an active guild membership. A list of classes sought is also included on our website for new recruits to peruse. We would prefer a healthy balance of player classes for guild activities. Therefore, if new 50+ players (or those sub cap players who show alot of drive and willingness to contribute) want to join our guild…we make room. Those members who have not given our council a note on our website or in game mail about “leave of absence” …and have not logged in within 60-90 days… are sometimes subject to removal, at random discretion, to make room for new members. I want to thank all the great members of Knights of Old Enclave for taking their time to answer my questions and letting me share their guild with the community. Thanks to their guild leader Lawrance for replying so quickly and all the other people I got to meet during my brief time with this guild. I wish them all the best in-game and in whatever they do. If you would like the get your guild or server event highlighted here at Corellian Run Radio, drop me an email at jason@corellianrun.com. See you all next week on Community Checkpoint!